I think I started reading this right as it started in 2012. After I while I stopped reading it, soon after the kyoto silver haired sister arc started, because I couldn’t take it anymore. Early Citrus is easily one of the most awful shoujo I’ve ever read. With Mei being written like a typical shoujo love interest taciturn dude that treats the main character girl like an unwanted insect. With tons of angst for no reason. Tons of unwarranted miscommunication. My main reason to stick up with it was to get more doses of Harumin, the best character in the manga by far. After a year or two I went back to it again, and I was pleasantly surprised with how once the twin sister arc ends, the manga gets much better. So much better that it feels as if another mangaka took over. It’s that much incredible. It’s a real shame the anime adaptation ends at the end of the twin sister arc. There’s still some drama but it’s handled much better. Many new characters are introduced and are all extremely interesting. Starting with Harumin’s big sister and her arc, which is my favorite part of the manga. That arc also introduce the Yuzu fan 1st year girl, which isn’t bad either. Then you’ve got the yakuza ojou sama which is another great character. And lastly there’s the café manager guy. A few weeks after the arc with Mei leaving to get married started, it was revealed that the manga would end in August 2018, confirming it’ll be the last arc. I was a bit disappointed and actually wanted the manga to last longer, seeing how good it was now. I thought that my final impression of the manga will greatly depend on the ending, especially whether it gives all the characters the attention they deserve. Seeing their personalities, I was expecting Yuzu’s mom and Mei’s dad to accept their lesbian relationship, but they accept it so fast when Yuzu decides to talk to them about it in the penultimate chapter, it feels as if she should have just told them at the beginning of the manga. As if everything up to this point could have been avoided. Then you’ve got the 2-3 pages where everyone accepts what’s happening, without any elaboration. We don’t know if manager guy actually loved Mei or not. We don’t know if cancelling the marriage had consequences on his side or not. iirc one of the really interesting points about him was that he was very similar to Mei, as in he didn’t want the arranged marriage either, but it would help his family if he did. Then there’s how Mei’s grandfather just accepted it. We see a scene with Mei’s dad talking about him, but as the author didn’t write any dialogue, there’s no information whatsoever on what happened. Did they actually tell him his granddaughter is a lesbian or not? Did Mei’s father decide to take over the academy or not? None of this is answered. Who will succeed the academy, Mei’s feelings about it etc, were a huge deal during all of the manga’s run, so it’s incredible it doesn’t even get an answer in the end. The biggest problem I have is of course how none of the other girls get any closure on what’s going on with their lives now. Harumin and her sister. The middle school brat(who was supposed to be in love with Yuzu and hate Mei so I’m surprised this wasn’t even brought up). The twintails thick brows vice president. The yakuza oujo. All of them are great characters and the only thing we’ve got are quick shots of them at Yuzu and Mei’s wedding, Shots which don’t even show their faces, as if Saburouta couldn’t bother drawing them after the supposed time skip leading to Yuzu and Mei’s wedding. Anyway, what matters most is the journey and not the destination. 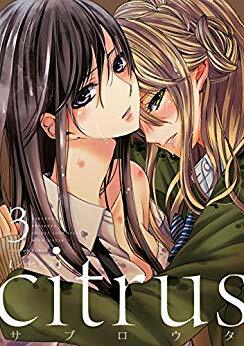 Once the twin sister arc ended, Citrus was definitely one of the best yuri manga out there until this precipitated ending. There’s still a spinoff ongoing, and there’s a sequel that’s starting in “winter”, which might be interesting. Not sure if it’ll be after their wedding or what happened before. Things happen so fast it’s not even clear whether there really was a timeskip or not before the wedding. Saburouta draws really well, and can actually write well too when she tries, so I hope her next works won’t have such an awful start and ending, and be consistent all along. Anyway looking forward to October. I hope Harumin is there.